It's that time again. 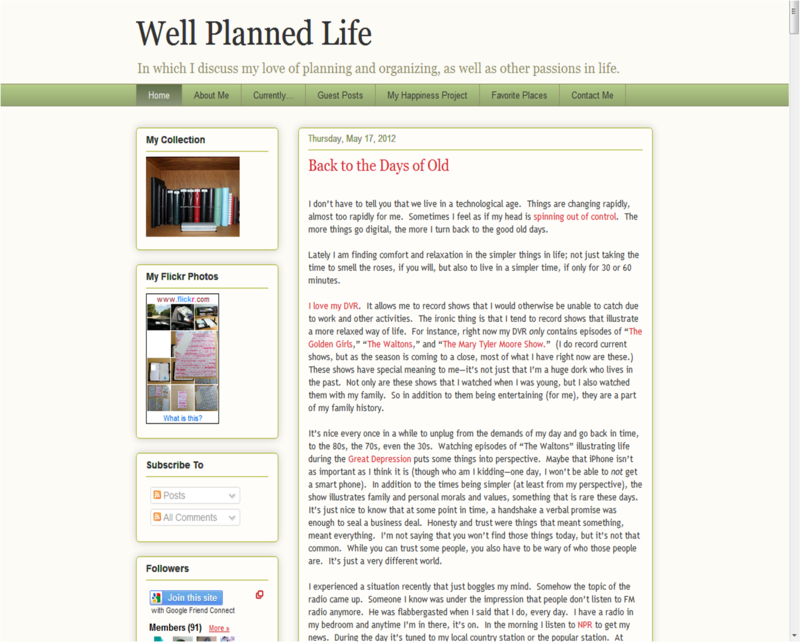 'Blog of the Week' looks at a different Filofax blog each week in the words of the owner. Some you may know already, whilst others may be new to you. This week, Kanalt talks about Well Planned Life. Philofaxy! Once I found this group of planner lovers, I was completely hooked. And while it was great to read and comment on the posts there, I had so much more to say about my own planner and organizational adventures. I'm a huge organizational nerd! Before checking, I would have said The Culture of Philofaxy at 1000 views. But the top pageview is still Happiness Binder: The Big Reveal with 1098 views. I would have to say The Culture of Philofaxy. I wrote it just because I had been thinking about it and wanted to put it out there. I didn't expect the huge response it got (both in comments and Twitter buzz). I think it just resonated with people, put into words how most people feel about the community, which just proves the Philofaxy-as-a-Subculture point. I was very overwhelmed by the response I got from that post. And that is why I will never find a better online community to be a part of! What has surprised me the most of how many people follow my blog. As of today, I have 91 public followers, though I would like to think there are more who aren't registered with my blog. Who knew that so many people would be interested in what I have to say, especially since it's about planners and organizing. many of my friends and family just laugh at my obsession, so I didn't think I'd attract as many people as I have. Thank you to each and every one of my readers! I love blogging and without them, there would be no point. It started as a place to talk about my planner obsession and grew from there - I talk about anything and everything, but mostly about planners and organizing. Have fun with it! Yes, we really do get tips and tricks from each other. But humor with our planners goes a long, long way, especially with me. You can see what I mean here. My thanks to Kanalt for participating.